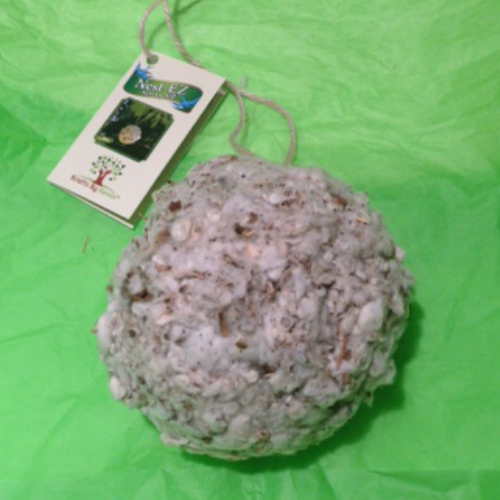 A Nest-EZ™ Nesting Ball is a grapevine ball filled with all‑natural material that birds can use to line their nests. The lining provides a fast‑drying soft cushion to protect bird eggs and hatchlings. A strand of jute twine is attached to each ball. Nest-EZ™ Nesting Balls can be hung from a tree branch, a fence or a shepherd’s hook. The ball may also be suspended inside a bird cage. Nesting balls can be hung year‑round. Be sure to hang nesting balls at least five feet from the ground outside the reach of mammals. Also, do not hang them too close to areas of high activity. We hope you enjoy watching birds visit a Nest-EZ™ Nesting Ball in your own backyard!